Real gross domestic product increased at an annual rate of 2.0% in the third quarter, reaching a annual rate of $14,730 billion (that is, from the second quarter to the third quarter), according to the “advance” estimate released by the Bureau of Economic Analysis. In the second quarter, real GDP increased 1.7%. The 3rd quarter real USA GDP was up 3.1% compared to the 3rd quarter of 2009. Just scanning the headlines gives a hint why investors are moving money into emerging markets: China up 9.6%, India 8.8%, Brazil 8.8%. The third-quarter advance estimate released today is based on source data that are incomplete or subject to further revision (the “second” estimate for the third quarter, based on more complete data, will be released on November 23, 2010). investment, federal government spending, and exports that were partly offset by a negative contribution from residential fixed investment. Imports, which are a subtraction in the calculation of GDP, increased. The small acceleration in real GDP in the third quarter primarily reflected a sharp deceleration in imports and accelerations in private inventory investment and in PCE that were partly offset by a downturn in residential fixed investment and decelerations in nonresidential fixed investment and in exports. The 12 stock for 10 years portfolio consists of stocks I would be comfortable putting into an IRA for 10 years. My main criteria was companies with a history of large positive cash flow, that seemed likely to continue that trend. In the original portfolio I created in April of 2005, I included Dell. Apple was one of the stocks I was considering but I chose not to include it. That has turned out to be a very bad mistake (though even with that the annualized return for the portfolio is beating the S&P 6%). As I have said the last few updates, I was considering dropping Dell. Since the last update, Dell has been dropped and replaced with Apple. This is the first decision to drop an original selection (First Data restructured and so it was removed). The current marketocracy* calculated annualized rate or return (which excludes Tesco) is 6.8% (the S&P 500 annualized return for the period is 2.6%) – marketocracy subtracts the equivalent of 2% of assets annually to simulate management fees – as though the portfolio were a mutual fund – so without that (it is not like this portfolio takes much management), the return beats the S&P 500 annual return by about 6.2% (it would be a bit less with Tesco, but still close to 6%). The current marketocracy results can be seen on the Sleep Well marketocracy portfolio page. Options strike most as exotic investment transactions. And some option strategies can be risky. But stock options can also be used in ways that are not risky. Call options give you the right to buy a stock at a certain price (the strike price) on, or before, a certain date (the expiration date). So if you want to speculate that a stock will go up in a short period of time you can buy call options. This is a risky investment strategy – though it can pay off well if you speculate correctly. Someone has to sell the call option. The seller gives the buyer the right to buy a stock at a certain price by a certain date. A speculator can do this and take the risk that the price will not rise to the level where a person chooses to exerciser their option. The also carries a significant risk, as if the stock price rises the speculator that sold the option has to either buy the option back (at a significant cost) or provide the stock (which they would have to purchase on the market). In order to trade in options you must be approved by the broker (at least in the USA) as an investor with the knowledge, finances and goals for which options trading is appropriate. An investor can also sell an option to buy a stock they own – this is called selling a covered call option. This means you get the price the speculator is willing to pay to buy the option and may have to sell the stock you own if the person holding the option chooses to exercise it. Welcome to the Curious Cat Investing and Economics Carnival: find useful recent personal finance, investing and economics blog posts. The world today has a much different economic landscape than just 20 years ago. China’s amazing economic growth is likely the biggest story. But the overwhelming success of many other countries is also a huge story. Today it is not the developing world that has governments spending taxes they promise their grandchildren will pay, but instead the richest countries on earth that choose to spend today and pay tomorrow. While “developing” countries have well balanced government budgets overall. There are plenty of reasons to question this data but I think it gives a decent overall picture of where things stand. It may seem like government debt should be an easy figure to know but even just agreeing what would be the most reasonable figure for one country is very difficult, comparing between countries gets even more difficult and the political pressures to reduces how bad the data looks encourages countries to try and make the figures look as good as they can. The poster child for irresponsible spending is Japan which has gross government debt of 218% of GDP (Japan’s 2009 figure is an IMF estimate). Greece is at 115%. Gross debt is not the only important figure. Government debt held within the country is much less damaging than debt held by those outside the country. 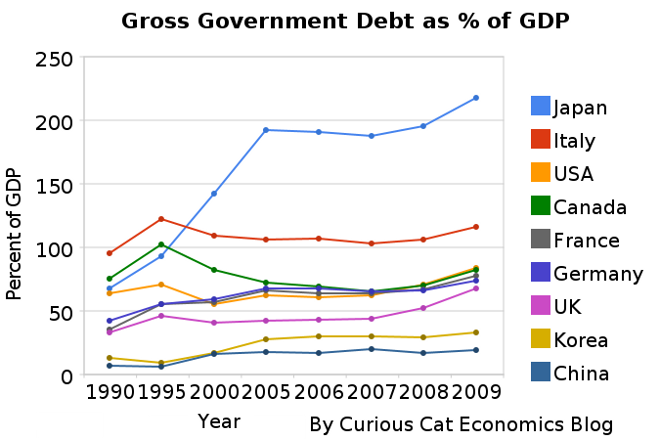 Japan holds a large portion of its own debt. If foreigners own your debt then debt payments you make each year are paid outside your country and it is in essence a tax of a portion of your economic production that must be paid. If the debt is internal it mean taxpayers have to support bond holders each year (but at least when those bondholders spend the money it stays within your economy). I made several more Kiva loans to entrepreneur in Kenya, Lebanon, Nicaragua, Kenya, Honduras and Armenia (brining my total loans to 251). It really is great to see real people using capitalism to improve their lives. And being able to help by lending some money is wonderful. When looking for loans I give preference to loans that improve productivity and increasing capacity of the entrepreneur. If they use the proceeds of the loan to increase their capacity to produce they can pay off the loan and find themselves much better off. 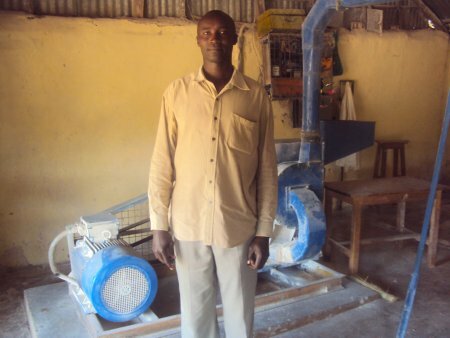 Douglas Osusu, Kisii, Kenya, in front of his posho mill (used for grinding maize into flour). A nice example of this is the loan to Douglas Osusu (pictured). He has requested this loan of 80,000 KES to purchase a dairy cow and a posho mill. This loan also has a portfolio yield (Kiva’s equivalent of an annual percentage rate) of 19%. 19% is very loan for loans on Kiva (remember there are significant costs to servicing micro-loans) – I like the rate to be under 30% but sometimes accept rates up to 40% (or even higher occasionally). I also give great preference to low rates, as the lower the rate the better for the entrepreneur. The 3rd factor I consider is the history of the field partner bank (default rate, delinquency rate and currency exchange loss rate). In this case the field partner is new and carries risk because of that. Still in this case I really like the loan and I like that this lender is charging low rates so I want to take the risk and see how they can do. The amount I lend is based on the combination of these factors – I lend more when I have several reasons to really like the loan. Join other readers by making loans and joining the Curious Cats Lending Team: 8 members, 213 loans totaling $8,775. Comment with the link to your Kiva page and I will add a link on Curious Cat Kivans. My current default rate is 1.39% and the delinquency rate is 8.49% (see chart of USA general delinquency rates). The delinquency rate is exaggerated due to technical details (some difficulties in reporting in various countries and such things). Agricultural loans often become delinquent on Kiva but still are paid in full (in my experience). While the defaulted loan rate is 1.39% if you look at the percent of dollars lost I have a rate of 1.2% (this is nearly all due to a bank that failed over a year ago to which I had 2 loans where I lost $87.50 of $100 – there are also 2 other losses for under $5). I add to my total loan amount a couple times a year but also I get to keep relending as money is paid back. Some of my favorite ways to help reduce extreme poverty are Trickle Up, Kiva and using Global Giving to find small organizations. Some companies (Banks, Verizon, Comcast, credit card insurers, United, car dealers…) continually find new ways to be hostile to customers. It really is amazing people put up with their horrible practices. The latest from the fees to check bags, fees to for paying company expenses, waste your time on voice mail hell if you want to talk to us crowd is fees to pay bills using automated systems. if you are to go Chase, Wells Fargo, Bank of America and you want to use their automated phone system — no human beings within sight — $15. And yet these guys are charging $15. I asked Chase, “How can you charge that much for an automated transaction?” They said, “Well, that’s how much we charge.” And you look at some of the other charges out there. For instance, this week Verizon Communications is introducing a new $3.50 charge if you pay your bill online, automated phone system, or to a service rep without using their recurring, automatic bill paying system. AT&T is a little better. It charges $5 if you pay by phone with a real, live service rep, but there’s no charge for using the company’s automated system. Time Warner Cable charges $4.99 to pay by phone with a human being, but it too charges nothing to use the automated system. Related: Protect Yourself from 11 Car Dealer Tricks – Poor Customer Service: Discover Card – Best Buy Asks Man to Change His Name – Is Poor Service the Industry Standard? Law enforcement officers, pre-Kindergarten through 12th grade teachers and firefighters/emergency medical technicians can contribute to community revitalization while becoming homeowners through HUD’s Good Neighbor Next Door Sales Program. HUD (United States Department of Housing and Urban Development) offers a substantial incentive in the form of a discount of 50% from the list price of the home. In return you must commit to live in the property for 36 months as your sole residence. Eligible Single Family homes located in revitalization areas (there are hundreds of revitalization areas across the country. HUD is always working with localities to designate new areas) are listed exclusively for sales through the Good Neighbor Next Door Sales program. Properties are available for purchase through the program for five days.